The Nintendo 2DS launched this weekend in both black + blue and red + white at a lower-cost than the Nintendo 3DS and 3DS XL. Nintendo's new lower-cost handheld console has the same layout as any other Nintendo DS with a thumbstick, D-pad, four face buttons, two shoulder buttons, a start button, a select button, and a home stud tucket in below the second lower screen. The new console does not have the 3DS hinged design and 3D visual effects, but at £109.99 it comes in at a lower price than the 3DS XL priced around £164.99, and 3DS at £139.99. Nintendo's official website states, "The new Nintendo 2DS system gives you all the features of the Nintendo 3DS and Nintendo 3DS XL, minus 3D viewing. And the price makes the world of Nintendo games even more accessible." 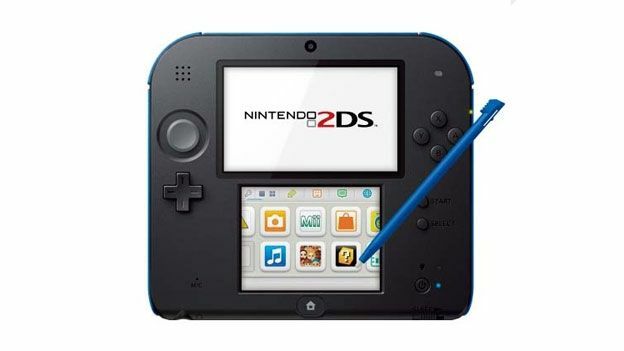 The Nintendo 2DS has compatibility with all Nintendo 3DS and most Nintendo DS games, access to the Nintendo eShop, wireless connectivity for multiplayer and co-op play, and parental controls. The console comes with a Nintendo 2DS stylus, SDHC Card, Nintendo 3DS AC adapter, and AR Cards. Read T3's review of the Nintendo 2DS here. Check out T3's Nintendo 2DS unboxing video below.